Anthology comic books for Marvel and DC are commonplace across the world, everywhere except for the USA. Well, as of a week-and-a-bit’s time, that is going to change. 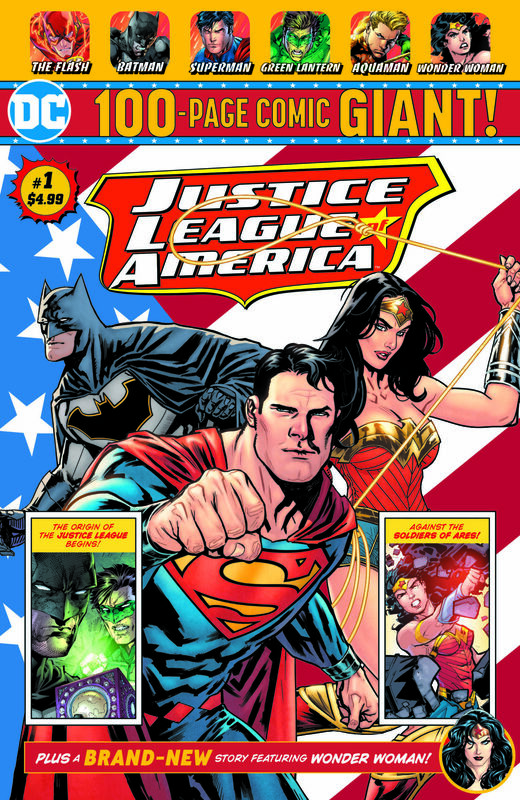 Starting from the first of July, Bleeding Cool understands that DC Comics and Walmart have done a deal to exclusively sell four one-hundred-page DC Comics anthology titles every month, featuring both old stories and brand-new content previously unavailable. Copies of these comics will sell in over three thousand Walmart stores across the country. This follows Bleeding Cool’s scoop that GameStop is to start trialling sales of new comic books distributed through the direct market. The new stories will include work including a 12-part Superman story by Tom King and a 12-part Batman story by Brian Bendis starting in September. 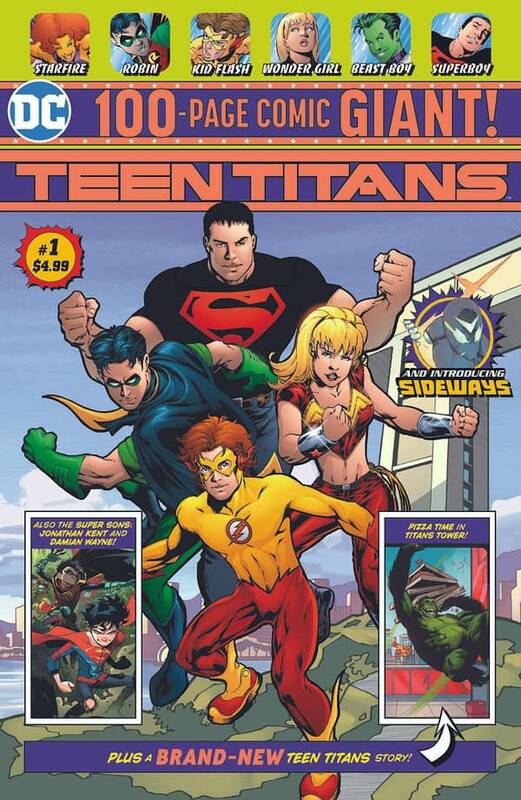 The four titles as Superman Giant, Justice League of Ameria Giant, Batman Giant and Teen Titans Giant. Here’s what will be in the first – and subsequent – issues of all four new anthology series out in July. Batman Giant #1 will feature a new story by Jimmy Palmiotti and Patrick Zircher, One More Chance. Batman, the world’s greatest detective, is on the case of a missing girl, but what happens when the trail in his newest case leads him back to a place from his past that he never expected to revisit? 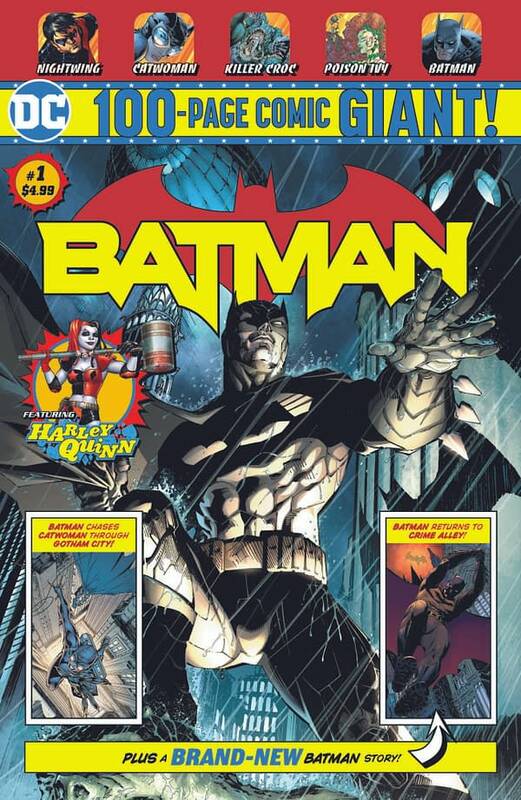 Batman Giant #1 also includes Batman #608 from 2002 by Jeph Loeb and Jim Lee, beginning a serialisation of Hush, Nightwing #1 from 2011’s New 52 relaunch by Kyle Higgins and Eddy Barrows, Harley Quinn #1 from 2011’s New 52 relaunch by Jimmy Palmiotti and Amanda Conner. While Batman Giant #3 will begin Brian Bendis’ second Batman work with a 12-part story, Universe. 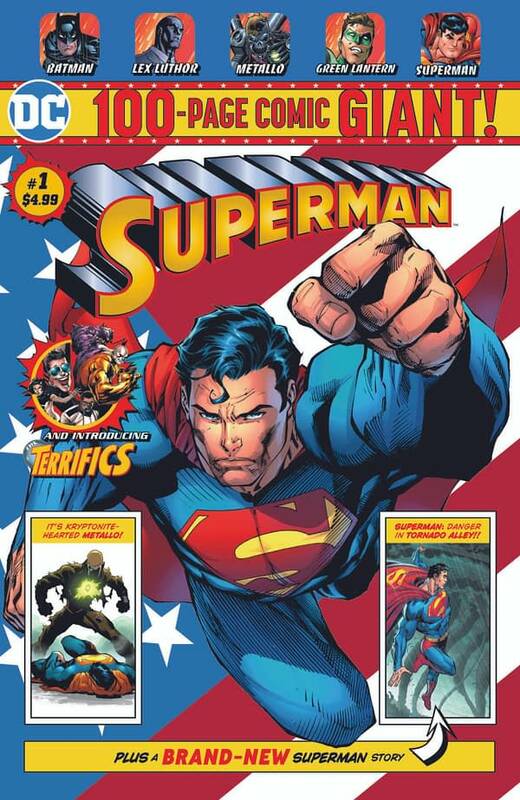 Superman Giant #1 will feature chapter one of the two-part Endurance, an original story by Jimmy Palmiotti and Tom Derenick. The Daily Planet sends Clark Kent to Tornado Alley to do a story on the area, but when the storm hits, it turns out that this mild-mannered reporter is more helpful as Superman. 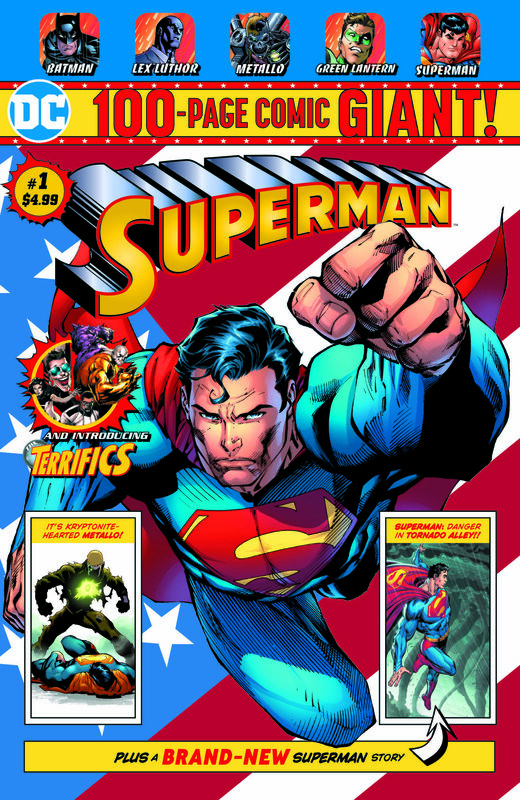 The issue also includes The Terrifics #1 by Jeff Lemire, Ivan Reis and Joe Prado from 2018, Green Lantern #1 from 2005 by Geoff Johns and Ethan Van Sciver, Superman/Batman #1 from 2003 by Jeph Loeb, Ed McGuinness and Tim Sale. When a little girl is kidnapped and taken from Earth, Superman embarks on a galaxy-spanning mission to find the perpetrators…but has to decide what lengths he will go to in order to save one life! Wayne Faucher and Jim Charalampidis, the Teen Titans’ pizza dinner is interrupted by the introduction of a new villain, the Disruptor. Teaming up with the Fearsome Five and working as an agent of H.I.V.E., he had one mission: kill the Teen Titans! The battle spills onto the streets of San Francisco, putting its citizens at risk, while H.I.V.E. uses this distraction to begin their plan for world conquest! The issue also includes Super Sons #1 from 2017 by Peter J. Tomasi and Jorge Jimenez, Sideways #1 from 2018 by Dan DiDio, Justin Jordan and Kenneth Rocafort and Teen Titans #1 from 2003 by Geoff Johns and Mike McKone. Justice League Of America Giant #1 will feature Wonder Woman in The Conversion, an all-new story from Tim Seeley, Rick Leonardi and Steve Buccellato. In this single-issue story, Wonder Woman comes face to face with Ares, god of war—who sees her as a promising new recruit! 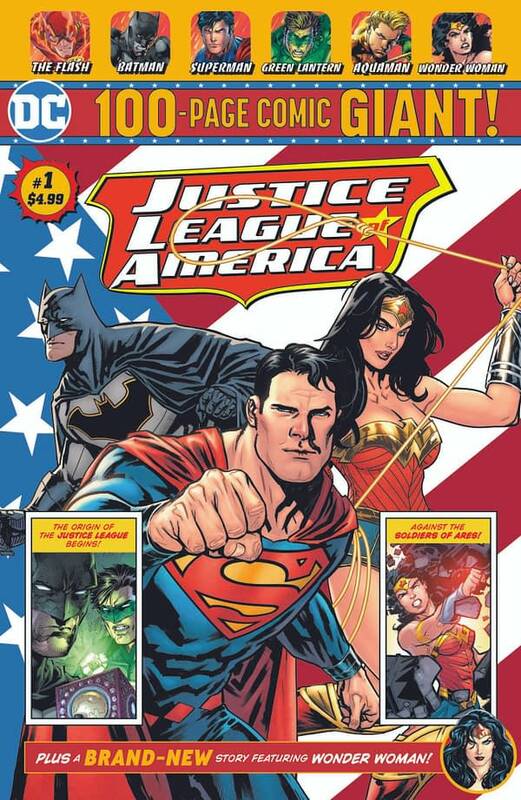 Justice League Of America Giant #1 will also include Justice League #1 from 2011’s New 52 relaunch by Geoff Johns, Jim Lee and Scott Williams, Flash #1 from 2011’s New 52 relaunch by Brian Buccellato and Francis Manapul, Aquaman #1 from 2011’s New 52 relaunch by Geoff Johns, Ivan Reis and Joe Prado. 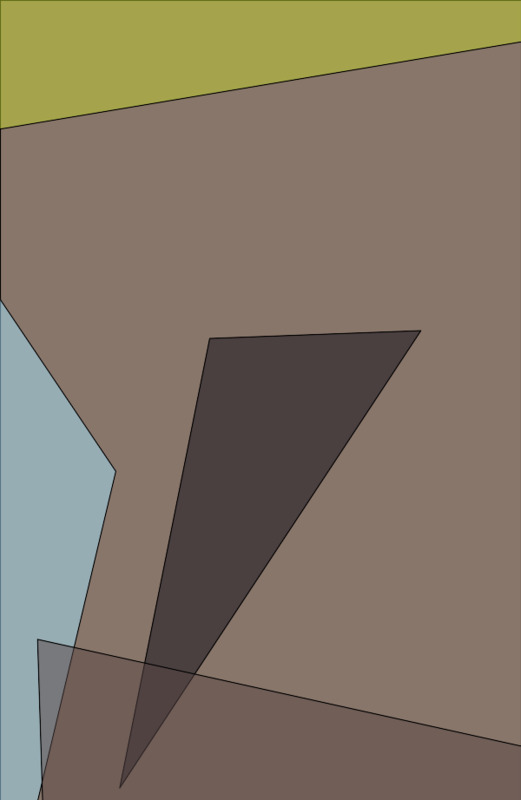 From issue 2, Tim Seeley, Felipe Watanabe and Chris Sotomayor will have a one-shot story, Mother’s Day. Wonder Woman returns to Paradise Island for the first time since her exile, only to find that the Amazons – and Queen Hippolyta – have been abducted by Echidna, the mythological Mother of Monsters, with a brood of unstoppable beasts as children! And from issue 3, an original 12-part Wonder Woman story by Amanda Conner and Jimmy Palmiotti called Come Back to Me. When Steve Trevor’s plane crashes on an island outside of time itself, it’s up to Wonder Woman to rescue him from this mysterious land, full of monsters, dinosaurs and some very surprising citizens. How the rest of the world will have access to these stories is unknown, as is whether or not comic book retailers will ever get copies, especially of the original stories. Could we see collections down the line? Possibly. But the exclusive nature of these collections and original work from some of DC’s biggest and most popular talent is going to rankle comic shops I would expect.